I have roleplayed intensively on the Europa server of Ultima Online. I have also roleplayed in EVE, Everquest, City of Heroes, Champions Online and briefly in Star Trek Online. In the past I have done pen and paper AD&D and Vampire. I have also been an avid PBEM simmer in a Star Trek setting and have run my own sims in a group called Bravo Fleet. I also like to write short works of fiction and have written short stories set in the grim Warhammer 40k universe. I have read your recruitment thread on the official Conan forums. This guild is by far the most colorfull I have ever seen in my MMO career. The House of the Rose offers a style of RP that I have never before engaged in and I have roleplayed a wide variaty of very different characters in the past. I am pretty new to the world of Conan and I would like an interesting colorfull environment to develop my character in. My character is pretty flexible in the work she does so basicly anything that would be required. 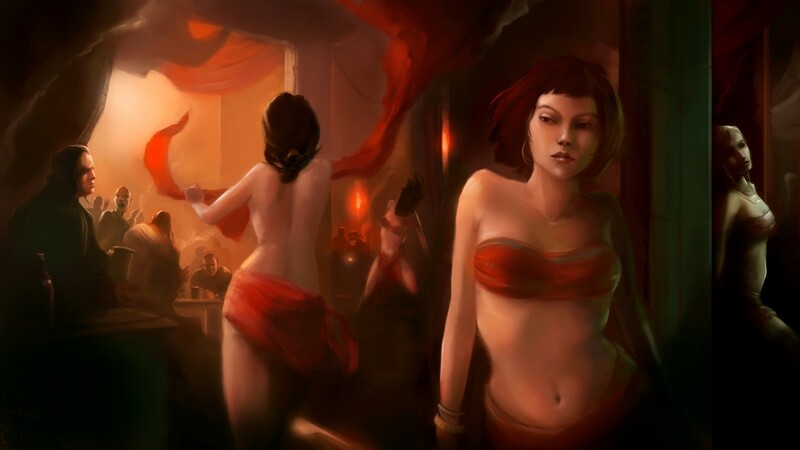 I have never RP'ed a courtesan before though or any character remotely like that. Usually any weekday works for me, except for Fridays. Sometimes I can also be there on Saturday and Sunday. I definately will. I tried dropping by yesterday evening but I saw nobody from the Rose. I intend to drop by at the event tonight at the tavern. I heard you guys are hosting it. So keep an eye out for me ICly. I'll probably be the shy and silent girl. Yeah, I did. I saw two girls sitting near the well. I thought they maybe were a rival/competitor's guild or something. I hadn't realized that was you guys. I am pretty new to Age of Conan so I don't know the community on Hyrkania. There's no rival guild around the House (yet). Nor is that likely to happen. We RP the building as 'ours' (i.e. Phoe purchased the property and has the deed to it). If someone comes over with a flag, our guards will sternly ask them to leave. Ahhhh I see. Hmmmm, I suppose that's why I always stay away from strange buttons in guildmenu's. Had something similar happening to me in Ultima Online once. I ended up trashing the whole guild. And I once messed up some settings in EVE that gave some people access to parts of the corporate hangar they shouldn't have had, haha. Good to know there is no rival. Thanks for clearing up the thing with the Tulip. I or, better said, Auriane will see you guys tonight!